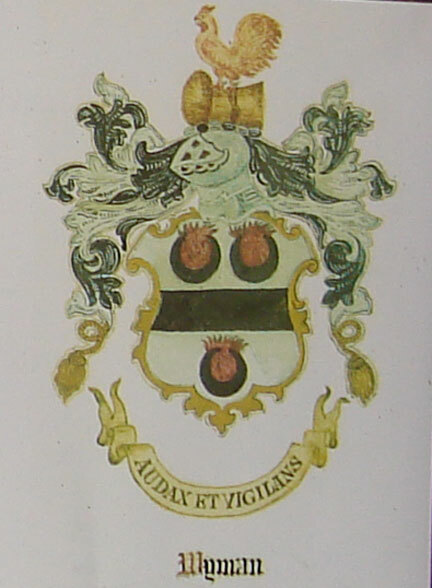 Francis WYMAN (1619 – 1699) was Alex’s 10th Great Grandfather, one of 2,048 in this generation of the Shaw line. Francis Wyman’s name survives in a portion of Route 62 in Burlington west of Cambridge Street known as the Francis Wyman Road and Francis Wyman School , Burlington, MA. It also lives on in the ancient Francis Wyman House, a colonial landmark on Francis Wyman Road. 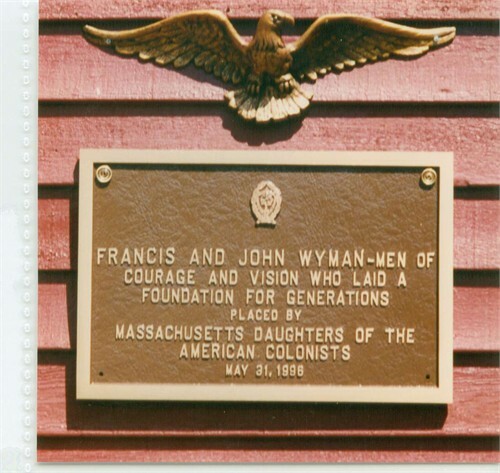 Furthermore, it survives in the name of the Francis Wyman Association, created about 1900 to restore the house and preserve the early family history of all American Wymans. 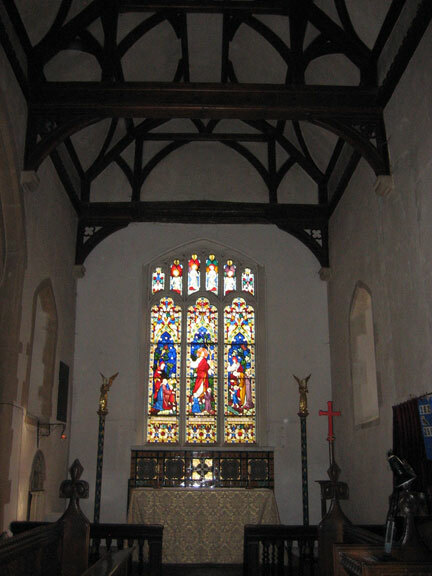 Francis Wyman was baptized 24 Feb 1618/19 in Westmill, Hertfordshire, England. His parents were Francis WYMAN(T) and Elizabeth RICHARDSON. The two Wyman brothers Francis and John were seventeen and fourteen in 1636 when they immigrated and so probably came with their older uncles, Samuel RICHARDSON (1602 – 1658) and Thomas Richardson. [Abigail WYMAN married her second cousin Samuel’s son Stephen RICHARDSON] The first definite record that we find of the Wyman brothers in New England is when the town order founding Charlestown Village (Woburn ) were signed in 1640; which the Richardsons and Wymans all signed. By that date the Wymans were 21 and 18. Francis first married Judith Pierce 30 Jan 1644/45 in Watertown or Woburn, Mass. After Judith died, he married Abigail Justice REED on 2 Oct 1650 in Woburn, Mass. He owned a tannery at the present Main and Wyman Streets near Central Square. Francis’ house has not been recorded, but John’s house was a two story frame house 34 by 26 feet with 13 windows having 40 rods of land adjoining. By 1666 they had also built country farms in what is now Burlington, a few miles north, on what became the Billerica boundry. He lived to testify at the Salem Witch trials. Francis died 30 Nov 1699 in Woburn, Mass. and was buried in the Old Burial Ground. Judith Pierce was born in Norwich, Norfolk, England and died prior to 1650 in Woburn (now Burlington), Mass. Her parents were John Pierce (c. 1588 in England – 02 Sep 1661 in Watertown, Mass.) and Elizabeth Hart (18 Jun 1584 in England – 12 Mar 1667/68 in Watertown, Mass) John Peirce was a weaver in Norwich, Norfolk, England before his emigration. He was among the passengers on either the John & Dorothy of Ipswich with William Andrews the Master or the Rose of Yarmouth with William Andrews, Jr. the Master. These two vessels sailed from Ipswich, England and arrived in Boston 8 June 1637. Listed as passengers were “John Pers”, aged 49, weaver of Norwich, wife Elizabeth, aged 36, children John, Barbre, Elizabeth, and Judith, and a servant, John Gednay, aged 19. Francis and Judith had no children. Abigail Justice Reed was born around 1634 in Hertfordshire, England and emigrated with her parents as an infant on the ship, ‘Defence’ arriving on 6 Oct 1635. She was baptized 30 Dec 1638 in Dorchester, Mass Her parents were William REEDE and Mabel KENDALL. Abigail died after 1677 in Woburn, Mass. Francis Wyman and his brother Lieutenant John Wyman were among the first settlers of Woburn in 1641. They were tanners by trade, church members and persons of much respectability and worth. Francis and John became tanners in Woburn, perhaps having learned the craft in England (Buntingford, two miles north of Westmill, was a tanning center in Hertfordshire) Their tanning business carried on until 1768 when it was sold to David Cummings. The water needed for tanning was diverted from a brook which was done away with when the nearby Middlesex Canal was built about 1800. Woburn became the tanning center of the country. Francis Wyman was admitted freeman May 6, 1657. They owned together five hundred acres of land in Billerica. Francis and John had an older brother, Thomas, who stayed in England and inherited the family farm there. In 1658, their father back in England wrote out a Will giving small amounts of land to his sons John and Francis if they wished to return to England to claim it. 1640 – 500 acres of land in Woburn (now Burlington) was granted to Mr. Thomas Coytmore and was subsequently sold by Joseph Rock to Francis and John for £50 in Oct. 1667. 1655 – Rev. Henry Dunster, first president of Harvard College, sold 500 acres in what became the town of Billerica, Massachusetts to Francis and John Wyman for 100 pounds sterling. Dunster had been granted the land in 1648. Because of Dunster’s Baptist leanings, he was removed as the president of Harvard and apparently needed some cash. After some political maneuvering the pending town of Billerica was persuaded to lay out the grant which was entirely within the new town. The grant was on the border of Woburn, adjacent to where the Wymans already had land. Between the 1640s and 1660s, Rev. John Eliot (“Apostle to the Indians”) and Daniel Gookin both worked with Harvard College and others to Christianize local Indians — who likely came mostly from the Massachusett (Massachuseok), Wampanoag, Nipmuc, Penacook and Pawtucket tribes. 1657 – The Woburn selectmen agreed to exchange 94 acres of land the Wymans already possessed in the town for an equal amount “adjoining to their land at Billerica….” Again, in 1661, Francis exchanged with “the town of Woburn..a parcel of land lying in the treasury…(for land at)…his farm next Billerica.” That same year Billerica granted 70 acres in the same general area to the Wyman brothers, which was laid out- the return was made in 1663. 1665 – The Wymans purchased for the sum of 50 pounds, the Coytmore grant of 500 acres which was to be laid out in Woburn. The Woburn Selectmen attempted to have the grant laid out elsewhere, but the General Court in 1666 had it laid out at this time when the Woburn-Billerica boundary was being settled. It was stated that the grant was to be laid out “…in Woobourne bounds next adjoining to the land and houses of the said Waymens, apprehending it to be most convenient and profitable for them so to lye.” Interestingly, the deed of sale is witnessed by Caleb Cheeshahteaumuck – a Martha’s Vineyard Indian who was the solitary Indian to have graduated from Harvard College at this time. 1671 – Francis, John, and eleven other citizens of Woburn were hauled before the County Court for publicly manifesting contempt for the ordinance of baptism and for attending illegal assemblies of the Anabaptists. Nothing much happened and both were later active in the local (Congregational) church. John Wyman seemed to have been convinced of the ‘error’ of his ways and was admitted back to the church in Woburn and took an active part in the settlement of Rev. Jabez Fox as a colleague of Rev. Thomas Carter in 1697. In his will 10 March 1683/4 he gave them 40/ each calling them his ‘Reverend Pastors’. Francis however always retained his partiality for the Baptists for in his will 5 Sept. 1698 he gave to two elders of the Baptist Church in Boston, Mr. Isaac Hull and Mr. John Emblen £20 each. grievances, and the church also to declare the whole case for the hearing of their proceedings: And after the case is fully heard by the said councill, they are to endeavor the healing of their spirits, and making of peace among them, for the issuing of matters according to the word of God, and to make returne of what they shall do herein to the next county Court to be held at Cambridge: And the Recorder of this Court is ordered seasonably to signify the Court’s mind herein to the several churches above named. It is ordered that the Court’s final determination in the above named case be respited, untill they receive the councill’s return, and the above named persons that were presented by the Grand Jury are ordered to attend at the next court at Cambridge. '(3) These people of Woburn were prosecuted before the Middlesex County Court Dec. 1671 for contempt for the ordinance of Infant Baptism as administered in the church of Woburn and for withdrawing from that church and attending the assemblies of the Anabaptists which was not allowed by law. An early map of the Daniel’s farm in Billerica dated 1668 shows two Wyman houses on land in Woburn at the present site, although it must be admitted that the map leaves much to be desired in the way of scale; nonetheless, the houses of Francis Wyman and John Wyman appear approximately the correct location in Woburn (now Burlington). By 1669 the Wyman farm had developed to the point that Billerica says a boundary dispute that what they were really after was the tax on the “great farme which the Wymans bought & (amounting to) 8 or 9 pounds p. annum.” The same year reference is made to Francis Wyman’s present habitation ” & neere the line &” and to the fact that Wyman paid tax to both Billerica and Woburn. As early as 1672 reference is made to Francis’ “old” house in Woburn center, and in the rates for 1674 and 1675 Woburn lists separately his farm, as well as his house and estate near the center of town. 1692 – Many sites and even some books state that Francis Wyman testified in the Salem Witch Trials that Margaret Scott of Rowley, “came to him and did most grievously torment him by choking, and almost pressing him to death, and he believed in his heart that Margaret Scott was a witch.” The accuser was actualy Frances Wicom. Beginning in 1892, Francis Wyman was erroneously thought by Salem historian Winfield Scott Nevins to have sent Salem accused witch victim Margaret Scott to her tragic Salem Gallows Hill death. Nevins was thrown off by the peculiarities of Puritan penmanship to believe that Frances Wycomb of Rowley was one and the same person as Francis Wyman — which she was not. Benjamin Scott, and Margaret his wife, came from England, time unknown. They first appear in Braintree, soon remove to Cambridge, and in 1651 were in Rowley. He died in 1671, as his will was proved September 26 of that year. They had a daughter Hannah, probably born in England, who married Christopher Webb. The widow Margaret was hung at Salem, September 22, 1692, “guilty of certain arts called Witchcraft and Sorceries.” She was arrested August 4, 1692, had a preliminary examination August 5, was sentenced September 19, and executed September 22. Margaret Scott fits the stereotype of the classic witch identified and feared for years by her neighbors in Rowley, Massachusetts (a small town to the north of Salem). Margaret had difficulty raising children, something widely believed to be common for witches. Her husband died in 1671, leaving only a small estate that had to support Margaret for years. Margaret, who was thus forced to beg, exposed herself to witchcraft suspicions because of what the historian Robin Briggs has termed the “refusal guilt syndrome.” This phenomenon occurred when a beggar’s requests were refused, causing feelings of guilt and aggression on the refuser’s part. The refuser projected this aggression on the beggar and grew suspicious of her. It also appears that when Margaret Scott was formally accused, it occurred at the hands of Rowley’s most distinguished citizens. Formal charges were filed only after the daughter of Captain Daniel Wicom became afflicted. The Wicoms also worked with another prominent Rowley family, the Nelsons, to act against Margaret Scott. The Wicoms and Nelsons helped produce witnesses, and one of the Nelsons sat on the grand jury that indicted her. Frances Wicom testified that Margaret Scott’s specter tormented her on many occasions. Several factors may have led Frances to testify to such a terrible experience, including her home environment and its relationship with Indian conflicts. She undoubtedly would have heard first-hand accounts of bloody conflicts with Indians from her father, a captain in the militia. New evidence shows that a direct correlation can be found between anxiety over Indian wars being fought in Maine and witchcraft accusations. Another girl tormented by Margaret Scott’s specter was Mary Daniel. Records show that Mary Daniel probably was a servant in the household of the minister of Rowley, Edward Payson. If Mary Daniel, who received baptism in 1691, worked for Mr. Payson, her religious surroundings could well have had an effect on her actions. Recent converts to Puritanism felt inadequate and unworthy and at times displaced their worries through possession and other violent experiences. The third girl to be tormented spectrally was Sarah Coleman. Sarah was born in Rowley but lived most of her life in the neighboring town of Newbury. Her testimony shows the widespread belief surrounding Margaret Scott’s reputation. Both the Nelsons and Wicoms also provided maleficium evidence—a witch’s harming of one’s property, health, or family—against Margaret Scott. Both testimonies show evidence of the refusal guilt syndrome. However, what sealed Margaret Scott’s fate was the timing of her trial and its relation to the witchcraft crisis. Evidence from the girls in Rowley coincided chronologically with important events in the Salem trials. Frances Wicom initially experienced spectral torment in 1692, “quickly after the first Court at Salem.” Frances also testified that Scott’s afflictions of her stopped on the day of Scott’s examination, August 5. Mary Daniel deposed on August 4 that Margaret Scott afflicted her on the day of Scott’s arrest. The third afflicted girl, Sarah Coleman, testified that the specter of Margaret Scott started to afflict her on August 15, which fell ten days after the trial of George Burroughs and Scott’s own examination. Additionally, the fifteenth was only four days before the executions of Burroughs and other accused witches who were not “usual suspects” and thus brought considerable attention to the Salem proceedings. By the time that Margaret Scott appeared in front of the court, critics of the proceedings had become more vocal, expressing concern over the wide use of spectral evidence in the Salem trials. The court probably took the opportunity to prosecute Margaret Scott to help its own reputation. Margaret Scott’s case involved not only spectral evidence but also a fair amount of testimony about maleficium. Scott exhibited many characteristics that were believed common among witches in New England. The spectral testimony given by the afflicted girls further bolstered the accusers’ case. To the judges at Salem, Margaret Scott was a perfect candidate to highlight the court’s effectiveness. By executing Scott, the magistrates at Salem could silence critics of the trials by executing a “real witch” suspected of being associated with the devil for many years. 1699 – After Francis died, his son William occupied the country house with his wife Prudence Putnam of Salem. She was the daughter of Lt. Thomas Putnam and Ann (Holyoke)- two other very interesting lines. In brief, the evidence indicates that the Wymans had many acres of land to farm as early as 1655. This, together with the several significant town grants as well as the 500 additional acres of the 1665 Coytmore grant indicate considerable activity in developing the land, enough to account for each brother to build a house. These houses are referred to in 1666. Prior to 1675 Woburn had no significant Indian trouble which would cause settlers to fear to live on the outskirts of the town. The country house of Francis, built sometime before 1666, stood on the site now owned by the FWA. The present structure is an eight room, two story, center-chimney house with attic and half-cellar, that is listed on the National Register of Historic Buildings. While some believe the house to date to 1666, few vestiges of that era remain, and the replacement house dates more nearly to 1710-1730. Francis and his brother John were among the largest landholders in Woburn, Massachusetts. A genealogy book about the history of the Wyman and Trask families indicates that John and Francis Wyman “were with one exception the largest landholders in Woburn.” Here’s link to Google Maps Street View of Francis Wyman Road in Burlington, Mass. He built his house about 1666 on the outskirts of Woburn, now part of Burlington. It was still standing in the 20th century. Every fall for over 100 years, the Wyman Family Association hosts a gathering of the clan at the Francis Wyman house in Burlington, Massachusetts. The homestead still stands at 56 Francis Wyman Road, built in 1666, and is one of the three oldest houses in Massachusetts. Unlike most old, historical homes, the Wyman house is owned by the family association, not a museum or historical society. The house was originally built as a garrison, where families could flee in case of war or Indian attacks. It was used as a prison for captured British soldiers in 1775, and it is listed on the National Register of Historic Places. The house has suffered through fire and damage over the years, but the family association has taken on the burden of insuring, restoring and displaying the house to the public. A fire in 1996 caused major damage to the interior of the house. They are reconstructing an old Burlington barn on the property for rental purposes, to help fund the completion of the restoration. April 1775: House sees some action, outbreak of the Revolutionary War. Massachusetts Colony was a hotbed of sedition in the spring of 1775. 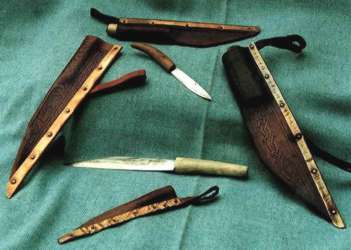 Preparations for conflict with the Royal authority had been underway throughout the winter with the production of arms and munitions, the training of militia (including the minutemen), and the organization of defenses.In April, General Thomas Gage, military governor of Massachusetts decided to counter these moves by sending a force out of Boston to confiscate weapons stored in the village of Concord and capture patriot leaders Samuel Adams and John Hancock reported to be staying in the village of Lexington. 17 April 1775 – Nearby in Billerica, just beyond the property line of the Francis Wyman house, is the cellar hole of the Amos Wyman house, originally John’s farm. 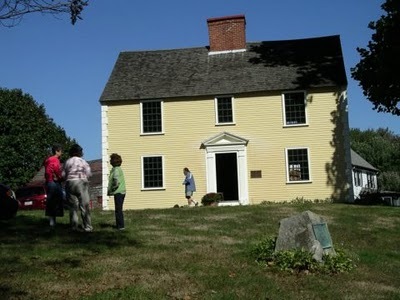 Samuel Adams and John Hancock, two of America’s forefathers, fled to this home from Lexington, ahead of the British troops. Elizabeth (Pierce) Wyman, wife of Amos, is said to have fed her visitors boiled potatoes, pork and bread instead of the salmon which her guests had planned to eat at the Lexington parsonage. , and Hancock is reported to have sent a cow to his hostess at a later date in appreciation of her hospitality. 18 Apr 1775 – The lantern’s alarm sent Revere, William Dawes and other riders on the road to spread the news. The messengers cried out the alarm, awakening every house, warning of the British column making its way towards Lexington. The house was restored by the Francis Wyman Association, a private association of Wyman family descendents, between 1899 and 1916. In 1916–the 250th anniversary of the house built in the wilderness–the Association opened the house as a tourist attration. It was again shown publicly ruding the 1930 Massachusetts Tercentenary clebration and in 1966, upon the 300th anniversary of 1666. In November 1996, a fire tore through the house, triggered by a curtain being ignited by an electric space heater. The Francis Wyman Association and the town of Burlington organized new efforts to better study and to restore the house. By 1997, Historic Preservation & Design’s team was selected to lead the new restoration. This was mostly a Salem-based undertaking with architects John Goff and Staley McDermet both hailing from our Witch City, supported by structural engineer John Wathne of Structures North, Inc. The SPNEA (Society for the Preservation of New England Antiquities) was engaged and it dispatched a team to help identify historically sensitive areas in the house. Warwick Carpenters of Gill, MA proceeded with a Restoration Phase I (structural work and exterior restoration) that was completed in 1999. Historic Preservation Associates of Wales, Mass., later advanced a Restoration Phase II (which focused mostly on the house interior) that was just completed in June 2011. Following a fire in November 1996, the property was extensively researched and the house was more accurately restored to show its ca. 1730 appearance (John Goff’s Historic Resources Survey form for 56 Wyman Rd.) Portions of the surviving Francis Wyman House (including basement walls and chimney base) may survive from ca. 1666, although most visible parts of the house are from a later ca. 1730 Georgian Period. This Phase II Interior Restoration Plan will restore the fire damage done to the 1666 home and create a first floor Francis Wyman House Historic Museum. It will complete the work for the first floor rooms and stairway, and make the building handicap accessible. The family association was established in 1899 for descendants of Francis Wyman to maintain the homestead as an educational resource and historic landmark. The Francis Wyman House is the oldest landmark in Burlington (originally part of Woburn, Massachusetts) and is listed on the National Register of Historic Places. William’s wife Prudence Putnam was born 28 Dec 1661 in Salem, Essex, Mass. Her parents were Thomas Putnam and Ann Holyoke. After William died, she married 11 Jun 1717 in Salem, Essex, Mass to Peter Tufts (b. 5 May 1648 in Malden, Mass. – d. 20 Sep 1721 in Medford, Mass.) Prudence died 1745 in Woburn, Middlesex, Mass. 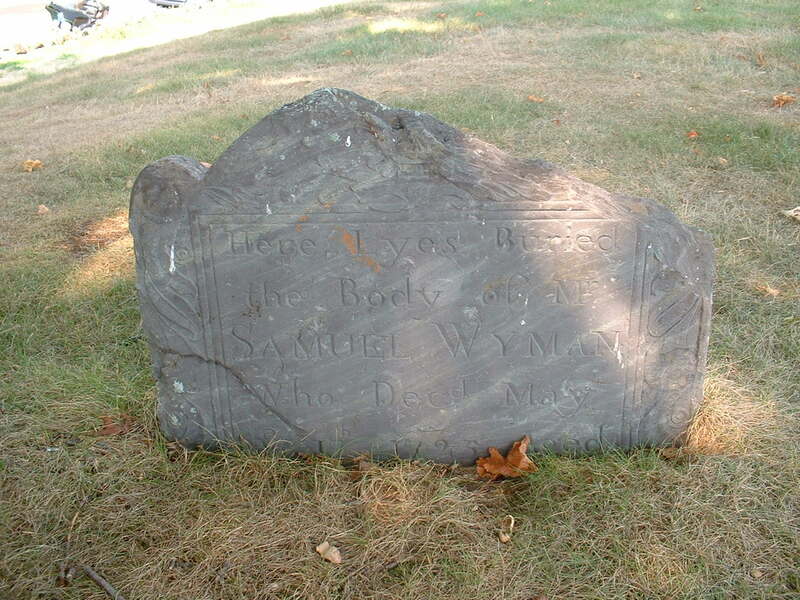 Nathaniel’s wife Mary Winn was born 1 May 1670 in Woburn, Middlesex, Mass. Her parents were Increase Winn and Hannah Sawtell. Her grandparents were Edward WINN and Joanna SARGENT. Mary died 7 Jun 1743 in Woburn, Middlesex, Mass. Samuel’s wife Rebecca Johnson was born 1 Mar 1665 in Woburn, Middlesex, Mass. Her parents were Matthew Johnson and Rebecca Wiswall. Rebecca died 13 Sep 1734 in Woburn, Middlesex, Mass. Thomas’ wife Mary Richardson was born 10 Mar 1679 in Woburn, Middlesex, Mass. Her parents were Nathaniel Richardson and Mary Peacock. She was Thomas’ second cousin, they shared great grandparents Thomas RICHARDSON and Katherine DUXFORD. Mary died 7 Jun 1743 in Woburn, Middlesex, Mass. Benjamin’s wife Elizabeth Hancock was born 26 Aug 1677 in Cambridge, Middlesex, Mass. Her parents were Nathaniel Hancock and Mary Prentice. After Benjamin died, she married 22 Sep 1739 in Woburn, Middlesex, Mass to Jonathan Bacon (b. 14 Jul 1672 in Billerica, Mass – d. 12 Jan 1754 in Bedford, Mass.) 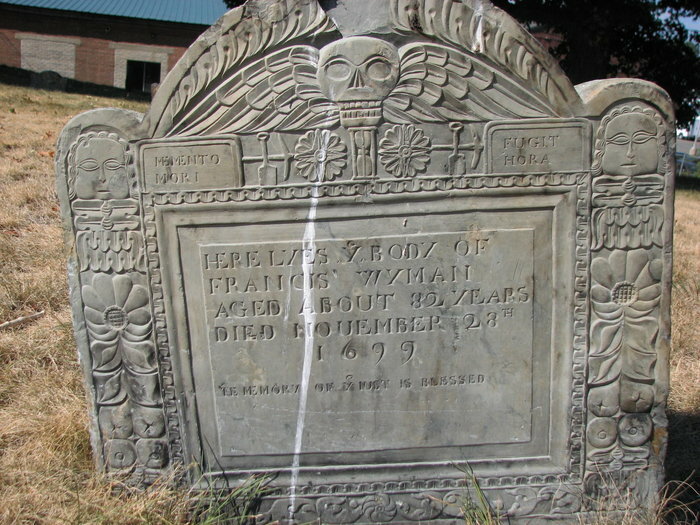 Elizabeth died 2 Mar 1749 in Medford, Middlesex, Mass. Judith’s husband Nathaniel Bacon was born 18 Sep 1675 in Billerica, Middlesex, Mass. His parents were Michael Bacon and Sarah Richardson. He was Thomas’ second cousin, they shared great grandparents Thomas RICHARDSON and Katherine DUXFORD. Nathaniel died 24 Jul 1750 in Lexington, Middlesex, Mass. This entry was posted in 12th Generation, Dissenter, Historical Church, Historical Monument, Historical Site, Immigrant - England, Line - Shaw, Pioneer, Place Names, Public Office, Storied, Witch Trials and tagged Apr 19 1775 - Minuteman, Margaret Scott, Slave Owner, Tanner, The night before the midnight ride, Woburn. Bookmark the permalink. Are any of these Wymans” related to the Vermont ones? ?They live in Cavendish Vt.?? ?One was Phil, Jeff…?? ?Stephen I hear was in jail? ?They related to Capens of Chester Vt.???RubyAnnCapen.???? Im also searching for Cobb of Vt.? ?Proctor of I guess came from Ca. Harriet Maria Proctor 1848..My gram..she married Peter J Knight..Wanted to see if there was anyone who knew her & mite be related??? ?Cobb from my dad side/Maurice R Cobb,Rawsonville,Vt. his mom Ethel H.Knight & Burton J Cobb..??? My Mother is Eleanor Ruth Farr. Her maiden name was Wyman from a farm in Starksboro, Vermont. She is Treasurer of the Chittenden County Daughters of the American Revolution. I recently grabbed her complete genealogy which includes Francis Wyman and made a 20 Meg word searchable Adobe pdf of it. I did it because mom is 80 and, although she is healthy as ever, I wanted to make sure it was not lost for my son, nieces and nephews. I am also putting together the story of the Farr’s, Wyman’s and Storrs’ (my wife’s family) in the Revolutionary War and Pre-Revolution America for my son as a side project in a Word document. The Miner Descent information has been very helpful In appreciation of your efforts I would gladly send mom’s Wyman genealogy to anyone interested in the research. I am sure Cavendish Wyman’s will have some descendants in common with those from Addison County. Thank you again for your excellent web site. Anyone know the meaning of “6 May 1657 – Francis admitted freeman in Woburn, Mass. “? Does anyone know if anywhere in the Wyman, was anyone related to Sitting Bull? Hello, my name is Reverend Minister Joel Wyman II, I am a 41 years old Reverend Minister, and I live in Maine, but I traced my family tree to Francis Wyman and all others discussed in this webpage, I would like the stories of the hero’s back then, When the Bitish came to arrest John HancHancock and John Addams my family, Amos Wyman hid them in there basement, if that isn’t a hero, who is? . My name is Joel Franklin Wyman and I’m interested in the great things my family has done, like when the British had warrants for John Hancock and John Addams, Amos Wyman hid them in there basement and the stories of Hezikia Wyman as (Death on a Pale Horse?